Is there a First Amendment right to cover sports news? American sports do not seem like the place for a show-down on the freedom of the press, but that is exactly why the unraveling of the First Amendment began there. Media purists from the “real” news side did not see the slippery slope sliding, just as they missed the impact of the Internet. There was a time that news sources needed news people to get the news stories to news readers, news viewers, and news listeners. The NFL decided it could offer a premium package to fans around the country who would pay a nice chunk of change to get games that were blacked out in their cities. NFL Prime Ticket kicked off a whole new wave of premium channels that cut the number of free games on the public airwaves, and allowed the major sports to monetize television viewing of the sport even better than pitting the Big Three networks against each other for contracts to carry their games on the old-school networks. Fans pay premiums ranging from a few pennies on their cable bill to a few hundred dollars a year to turn on the channels that let them see the games, news and commentary that they want on these proprietary sports networks. Yankees head honcho George Steinbrenner launched his “YES” television network and found hundreds of millions of dollars a year which he did not have to share with the networks or the other owners of baseball under the network TV revenue sharing agreements of MLB flowing into his coffers. One difference in YES programming was a lot of Yankee-specific news that went toe-to-toe with the New York news media for look and feel. That was the beginning of another revelation in the sports business: Instead of allowing ABC, CBS, NBC, ESPN and Fox Sports to control the news information flow about their product, the major sports could expand their program offerings on television and on the Internet to include their own “news” shows and websites, taking control of their news flow by covering themselves. The logic is that news is not news. Just as moving companies now call themselves “logisitics” firms, news is now called “content,” a thing to be monetized no different than hats and shirts, hot dogs and beers. No more going hat-in-hand to the local television station, or newspaper, to cover their world. Free sports programming of major league sports on the major networks has been shrinking year after year. While NFL started the trend, Major League Baseball (MLB) is finishing it off in a way that is so Orwellian, it opens up the much darker potential of a world where other newsmakers could try to end-run the Fourth Estate and create their own media outlets to promote their point of view to the world. 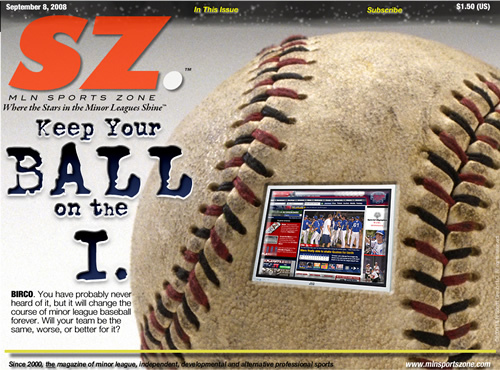 "Keep Your Ball on the I" was a cover story for SZ in September, 2008. This year, Major League Baseball (MLB) launched its MLB Network on television, and finished a four year putsch in the affiliated professional minor leagues (MiLB) to take complete control of 99 percent of the pro baseball news in North America via its MLB.com website (See: “Keep Your Ball on the I” at SCRIBD, a reprint of the article which originally appeared in September, 2008 at the digital sports magazine SZ). It did this largely through the blanket power that it exercises as a legal monopoly. Major League Baseball is the only business entity in the United States ever granted immunity from federal antitrust laws, giving them a business power really only rivaled for unfettered power by the Chinese government. It makes any move to block the will of the owners of MLB difficult because they are largely untouchable. “In its decision, the court ruled that baseball did not fall within the scope of antitrust laws because its business did not involve interstate commerce but instead was purely a state affair. “The Court affirmed the exemption in 1953 and again in 1972, when Curt Flood challenged baseball’s reserve system. The Court finally acknowledged that baseball engaged in interstate commerce and even noted the anomaly of its having such an exemption when other sports did not. But it determined that Congressional inaction to repeal the exemption implied a continued approval. MLB is migrating from using “rights fees” to control access to its coverage by a few big networks, to making its own network the preeminent source of news on the sport. Right now the big powerhouse networks ESPN and Fox pay millions in “rights fees” to give them equivalent access to MLB.com and the MLB Network. MLB monetizes their public relations through these fees. You pay for the privilege of reporting first and up-front. My first run-in with premium rights came at an MLB club during Spring Training in 2005, Sitting with local reporters and the reporter from the venerable Sporting News, which had not paid a rights fee to cover MLB, we all waited for 30 minutes after a game while MLB.com, ESPN and Fox were given exclusive locker room time with the players prior to the admission of the “general” media. At the Baseball Winter Meetings, two media rooms are set up in the same room. One for MLB.com, to which the rights holders have access, and one for the rest of the media. Official news filters through the MLB.com side first, and then makes its way, sometimes up to an hour later, out to the rest of the reporters covering the event. Over the last two years, most major leagues, starting with the NFL, have also intiated a 24, 48 or 72 hour “use” rule, which only allows content like game photos or video clip highlights on the Internet to remain on a non-premium-paying competing news website to be published for a day or three before being pulled down. Media credentials have been revised to make all members of the press covering a game sign off on these rules.The purpose is to keep the content, and the eyes, focused on the “official” media site. 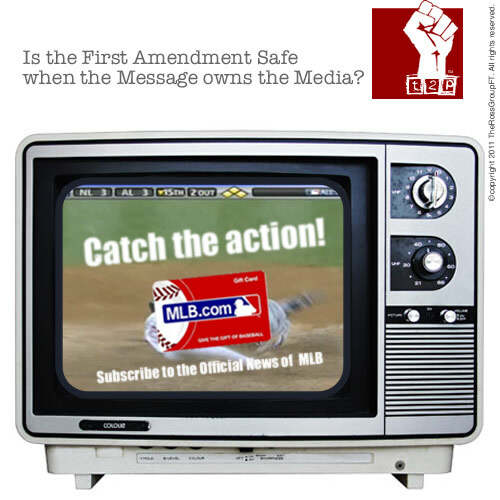 When you give MLB, the most legally unfettered business entity in the free world, the ability to also control an ever-increasing amount of its coverage by its owned media, is the public’s right-to-know being served? It might be one thing if MLB was beyond reproach, a squeaky-clean, well-run operation serving the public interest with players pure as the driven snow. This is the sport that cannot establish a performance-enhancing-substance testing system that is in keeping enough with international standards to have the International Olympic Committee re-admit baseball as an Olympic sport. This is the sport which has not been able to maintain even the appearance of high standards and ethics since the last independent Commissioner of Baseball was replaced by Bud Selig, former owner of the Milwaukee Brewers, who has not been a particularly great shepherd of the game. From the gaffe of the tie All-Star game to the steroids disasters which happened on his watch, he should have resigned after the Mitchell Report and a new Commissioner should have been found to clean house and restore the integrity of the sport. If the MLB Network will not touch a steroids story beyond reporting the suspension, and no one in the official media will ever be sanctioned to do investigative journalism uncovering the causes of the ills that affect the game, the public interest is not served, in my opinion. MLB is using the MLB Network to try to rebuild its audience for the sport by reaching out past its major league markets where there has been little or no growth in their audience. MLB attendance has been flat for years, averaging 76,269,000 a year over 2004-2008. Its biggest year, a high of 79,447,312 was during 2007 when alleged steroids cheat Barry Bonds broke the most hallowed record in the game, Hank Aaron’s all-time home run count. Growth for sports viewing is on television and the Internet. While the new MLB parks like the ones in New York and the upcoming ones in Florida are being downsized 10,000 to 20,000 seats, and prices are being increased for the remaining pews around the field, the MLB Network and MLB.com are trying to re-monetize millions of fans outside of the “major” cities through these new digital turnstiles. Newspapers great and small used to rely on a sports, style, home, and entertainment sections to draw in readership for their news. Now these staple draws to their publications can be easily found on the web or on TV from the league-owned sources. Increasingly, news sources do not need or want the news outlets anymore. Why would MLB need the independent-minded Boston Globe sports writers when they have their own highly complacent staff at the MLB Network and MLB.com who will not issue any challenge on any subject of significance? Expensive new stadium? The local paper may buck it. Your league-owned media will either tout the advantages or say nothing. A player caught with steroids? The local paper might rail against the fact that a major player every year seems to have a career implosion of this kind, but your official league network will not say much after they report the “official” line on the suspension, other than perhaps to help the player rehab their image, as the official mouthpieces did earlier this year with Manny Ramirez’ “rehab” run back into the game after a 50 game suspension for a positive PES test. League-owned “networks” are little more than advertising wolves in mock journalists’ clothing who sell public relations under the guise of news. The look and feel of CBS or NBC or ABC without all that pesky media contradiction, or that bothersome journalistic integrity. How does this impact the free press, not just in sports, but overall? If it works well for sports, think how that control could sell in politics! No more spinning of the independent press, just control the flow. No Katie Couric to allow Sarah Palin to drown in her own words. A GOP.com or a Democrat.com’s reporters would know where their loyalties rest. No pretense of “fair and balanced” like Fox or conduct of proper journalistic standards like MSNBC. Just a gloves-off free-for-all that has the look of news with the sales designs of an infomercial. There is a powerful, and compelling case for political machines, big corporations, and big government to join sports leagues and control their own news flow. The White House could have “The White House Network,” a 24/7 cable channel dedicated to the official political news of the president, given first-tier coverage of the White House, with CNN, the New York Times and the rest waiting for their turn, unless, of course, they paid the rights fees to have a prime seat in the room. Semi-official channels worked, so why not official news outlets? The Christian conservatives and the Neocons bought out the “liberal” media on the radio and set up the bully pulpit of Rush Limbaugh and others that drove millions of religious right zealots to the polls for Reagan, Bush the First and Dubbayah. In 2008, Barack Obama optimized the Internet to motivate one of the greatest political machines in world history. At one debate, the media spun a line that he was weak and he had missed his mark, until, within seconds, they started reading the backlash from millions of people reading and communicating directly over the Internet who disagreed with the talking heads. It forever altered punditry on television, which now has to use Twitter and other social engines to gauge how its news is being received by the viewers. The First Amendment protects both free speech and the public’s right-to-know. The folks who pay for the seats and the hot dogs and the beer, or pull a lever in a voting booth, have a right to know if the games that they watch are fixed, or the players are juiced up, or if a political party is lying to them or praying on their fears to get their vote. Money focuses eyeballs on a subject. If the folks with the power and the money own the media, even with the independent Internet, who will speak truth to power loudly enough to be heard over the theme music at the end of MLB Tonight? Source-owned media denigrates and destroys that First Amendment right when the “journalists” in its employ must look the other way rather than protect the public interest. The Internet and the explosion of cable television channels were supposed to set the Fourth Estate free. Instead, the powerful are still finding ways to control the information flow. You have a right to speak freely. The Constitution does not protect the size, shape, or location of the soapbox from which you speak. Unfortunately, as the sources of news are learning, they can build their own soapboxes bigger and better than the independent ones, and enforce their point-of-view. News is one avenue of life where size truly matters. What it portends for a free press in the United States is truly chilling. This entry was posted on August 15, 2009 by Brian Ross in 2009, ABC News, Baseball, Boston Globe, CBS News, Constitution, Corporatocracy, ESPN, First Amendment, Football, Fox News, Fox Sports, Keith Olbermann, Media, Media News & Criticism, MLB, NBC News, Newspapers, NFL, Political Punditry, Yankees and tagged Baseball, Bud Selig, First Amendment, First Amendment Rights, Fox News, Keith Olbermann, Media, Media News & Criticism, Mlb, MSNBC, News, Newspapers, Right To Know, Rush Limbaugh, Sports, Sports News, Television, Television News.